Philip Yancey has a gift for articulating the knotty issues of faith. 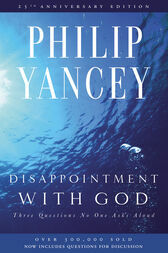 In this 25th Anniversary edition of Disappointment with God, Yancey poses three questions that Christians wonder but seldom ask aloud: Is God unfair? Is he silent? Is he hidden? This insightful and deeply personal book points to the odd disparity between our concept of God and the realities of life. Why, if God is so hungry for relationship with us, does he seem so distant? Why, if he cares for us, do bad things happen? What can we expect from him after all? Yancey answers these questions with clarity, richness, and biblical assurance. He takes us beyond the things that make for disillusionment to a deeper faith, a certitude of God's love, and a thirst to reach not just for what God gives, but for who he is. Included in this anniversary edition is a study guide with questions about these perplexing questions of faith that the author confronts.